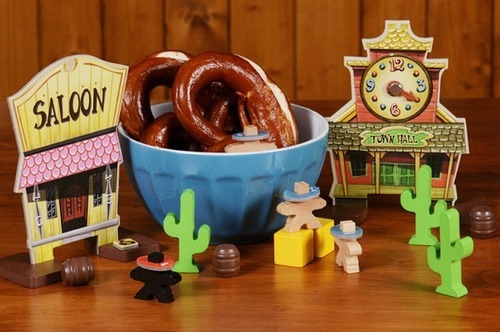 Flick ‘Em Up is the first release in the Pretzel Games line, a new subsidiary of F2Z Games that promises to bring light, beer-and-pretzels style games to the market. I first ran across this game at the Gathering of Friends in April 2015, and since playing it there, I’ve been eagerly awaiting its arrival on the market. 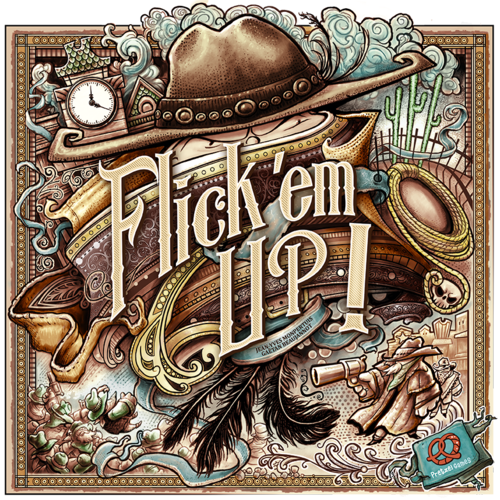 Flick ‘Em Up pits the lawmen of the town against the bandits of the Cooper Clan. Each side has five fighters (i.e. wooden meeples) that are distributed around town. Each team has a box which holds the player tiles and gives you a place to store the equipment and hit points for each of the five fighters. 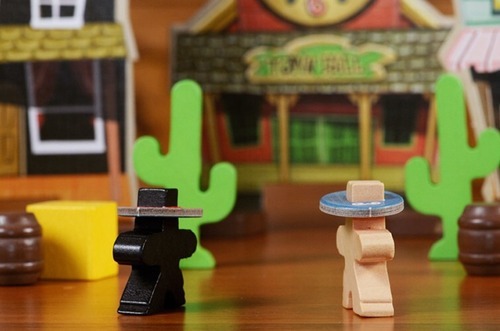 The wooden meeples wear numbered hats so that you can tell which one is which. The town is made up of a number of buildings – there are really just cardboard fronts that are balanced upon wooden supports. The Town Hall has a clock at the top of it – you will use this clock to keep track of the number of rounds in the game. The game is played in a series of scenarios – and the game comes with a nicely illustrated book that gives you ten scenarios to start with. Before you start to play, the players should agree on a scenario (or perhaps make up one of their own!). The scenario booklet will give you a diagram of how to set up the buildings, figures and other props. Additionally, it will give you the objective of each team as well as what equipment and hit points go with which character. The human players now split up into two teams – the rules recommend trying to keep numbers close to even, but it is not essential to do so. During the game, play will alternate between the good guys and the bad guys, and the human players that make up each team will rotate turns when their respective team is active. As mentioned earlier, all of the players wear a numbered hat – this helps identify them. These hats are reversible – each has a red side and a blue side. The scenario set up will tell you which color will be facing up at the start of the game. The color will match the color of the spot on the Town Hall clock that set up tells you to start on. For instance, the rules may tell you to start the clock at 6:00, which is a red number on the clock. All of the cowboys will start with red hats on as well. On a turn, the human player can choose any available cowboy on his team to be active this turn. A cowboy is active if the color of his hat matches the color of the current hour on the Town Hall clock. The active cowboy is allowed to take two actions each turn: move, shoot, or do something in a building. The cowboy can do them in any order and can repeat the same action twice. Once the player has taken both actions, he then flips the hat of that cowboy over to the opposite color. Therefore, this cowboy will not be available again until the next round of the game (i.e. after all the cowboys have had a chance to do something). To shoot – a player takes a grey bullet and places it to either side of the active cowboy – at the distance of one bullet away from the cowboy. The bullet is then flicked at any target. If the bullet hits a cowboy AND knocks that cowboy over, that cowboy takes a hit and loses one of his hit point markers. (If you somehow manage to hit your own teammate, your compatriot will also take the damage!) That cowboy will remain on the ground until he is next activated – therefore, he cannot be hit again until he takes his turn. Cowboys that are knocked over after a ricochet are not hurt and are simply replaced in their original position. If a cowboy loses his last hit point, his meeple is removed from the table. However, his hat is placed on the top of his team’s box. 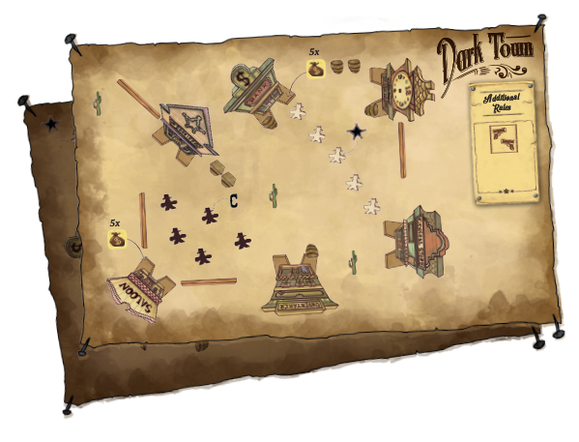 In order to ensure that each team takes the same number of turns each round, the deceased cowboy’s hat will still have to take its turn at some point and be flipped over. To do something inside the building – certain scenarios have tokens that are housed within buildings. If you are inside a building, you can use an action to pick up / drop off / exchange a token while you are there. You may only hold onto two tokens at any given time. The Duel – as I mentioned earlier, duels can occur inside a building when two or more cowboys from opposite sides are both there. 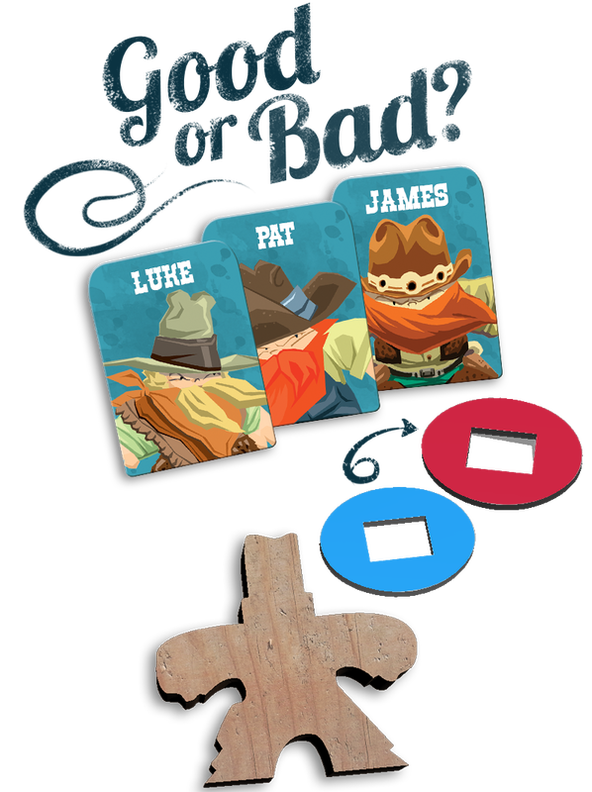 The two cowboys are moved to a part of the table reserved for duels and face each other – the distance separating them should be decided at the start of the game when the dueling ground area is set up. The player who last entered the building gets to fire first. The bullet is placed next to that cowboy and flicked. 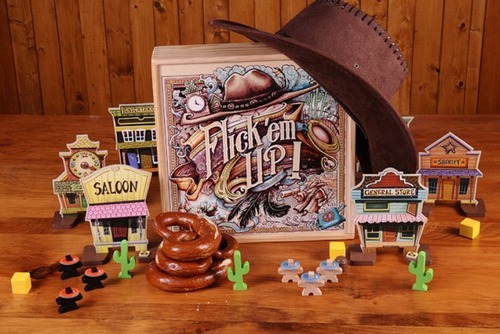 If the opponent is knocked over, he loses a hit point and is ejected from the building – the actual cowboy figure is flicked thru the building supports and thrown into the street! If the duel shot misses, his opponent gets to move closer by the width of the movement disc and then he gets to fire back. The two cowboys slowly inch towards each other until someone is hit. At the end of each round, all cowboys will now have their hats on the same side. 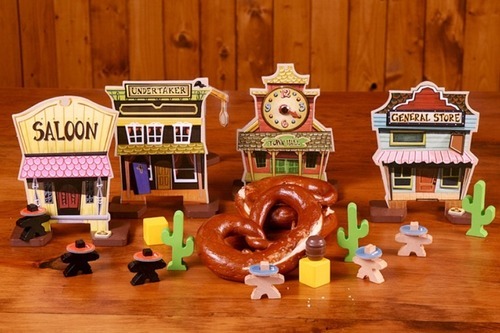 The town clock is advanced by one hour, and at this time, all of the cowboys now become available again. The game continues until either the clock hits midnight OR one of the scenario end game conditions are met. Each of the scenarios is different, and we’ve played through over half of the book thus far. Some of the them are straightforward gunslinging fights while others take a bit more planning and cooperation to achieve the goals. For example, the first scenario has the same goal for each side – knock three of the opponent cowboys out of the game. The “Witness to Slaughter” scenario, however, requires the lawmen to collect two pieces of evidence and bring them back to the Sheriff’s office while the outlaws are trying to prevent this from happening. While you still want to hit your opponents, there is a lot more thinking and strategizing about how to move your cowboys around to achieve your goals. Thus far, we have really enjoyed the game. We have set it up on a folding table for a smaller, more action packed game as well as on the ping pong table for a more spread out arrangement. The game rules are quite simple, and it just takes a few minutes to set up any given scenario and then explain any special rules that might apply to that particular scenario. The game has worked for us with as few as 3 players (me and my two boys) and as many as 8. While you obviously get more turns to be active in a 3-player game than an 8-player game, there is a lot of team discussion to be had with the more complex scenarios – similar to a cooperative game – so the players usually are involved in the game even when they are not the one flicking the discs. But… let’s face it, this is a beer-and-pretzels game. The slower pace of the big group game definitely gives you more chance to grab a cold one and participate in the fun game. Graphics are very evocative of the Wild West era/Spaghetti Westerns and are pleasing to the eye. The box is a hefty affair. If you see the box on a store shelf, you’ll note the nice art on the cover and the cardboard sides. However, the cardboard is just for show. The box itself is all wood, and the lid fits into a groove on the interior of that wood box. In fact, you need to remove the entire wooden box from the cardboard shell in order to put the cover on! The rules are laid out nicely into two books – one that outlines the main rules, and a second book that gives the different scenario setups. The version that I received is multi-lingual with English, French and German provided. The ten provided scenarios provide a wide array of objectives and the ones that we have tried thus far have all had a different feel to them. While I have not tried to invent any scenarios of my own yet, I can easily see plenty of opportunity for this. This is obviously not the second coming of Die Macher, but you should not be expecting that! The game delivers exactly what it advertises, a fun action-packed game with just enough strategy to keep it from being strictly a dexterity game. It should be fun for almost all ages (you just have to be old enough to be able to flick the wooden discs), and the different scenario possibilities give this an excellent replay value. Also, I have heard some rumours (to use the Canadian term) floating about that there may be a cardboard-based version of the game which may bring the cost down a bit. Not sure how true this is. More new about this as soon as I know it! We messed up the rules on the one play I had, which resulted in everyone turtling in buildings until time ran out. I’d like to try it again. I think it does what it wants to do very well. It’s not the sort of thing I love, but it’s reasonably fun and I’d certainly be willing to play it again.